(apsenews.com) - Organizers of a drive to recall Wisconsin Governor Scott Walker said they have far more signatures than they need to file on Tuesday to force the controversial Republican to defend his seat in a special election barely a year into his first term. Recall officials expect to turn in far more than the 540,208 signatures required on Tuesday to force a special election, a milestone in their effort to recall Walker and slow an agenda that has diminished the power of public unions. If the state Government Accountability Board, the agency charged with validating the petitions, determines enough valid signatures have been gathered, it will set a recall election for Walker and Lieutenant Governor Rebecca Kleefisch. Only two governors in U.S. history have been successfully recalled -- California's Gray Davis in 2003 and Lynn Frazier of North Dakota in 1921. No Democrat has emerged to run against Walker, although Milwaukee Mayor Tom Barrett, who ran for governor against Walker in 2010, and Secretary of State Doug La Follette have been mentioned as possible candidates. Others include former congressman Dave Obey, state Senator Jon Erpenbach and former Dane County Executive Kathleen Falk. By law, organizers had only 60 days to conduct the formal petition drive, which they launched in November with thousands of volunteers fanning out across Wisconsin. The roots of the drive stretch back nearly a year to efforts by Walker and the Republican-controlled state legislature to pass a raft of controversial measures that included strict limits on the union rights of public employees. The anti-union measures triggered weeks of mass protests in Madison and a fierce political backlash from Democrats and union supporters. 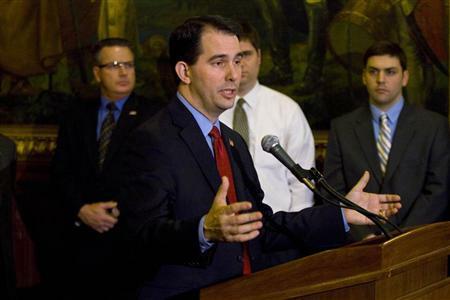 Walker defended the measures as necessary to address a budget gap and to make Wisconsin attractive to employers. Backing his agenda, which also included passage of voter identification and looser gun laws, six Republican senators and Walker allies faced recall last summer. Three Democratic senators who opposed the measures also faced recall. Of those, two lost their seats to Republican challengers. Along with the governor and lieutenant governor, as many as 17 state senators -- 11 Republicans and six Democrats -- could face recall elections this year in Wisconsin. The contests could tip the balance of power in the state senate, where Republicans hold a slim 17-16 majority. On Friday, organizers of a separate effort to recall Senate Majority Leader Scott Fitzgerald said they had enough signatures to force the Republican to defend his seat in a special election. Fitzgerald has filed a complaint with the GAB, claiming recall organizers took too long to collect signatures. According to a GAB report, processing the Walker recall petitions will cost the state more than $650,000, including the purchase of software and staff time. The total cost of recall elections for the state and municipalities may be more than $9 million, according to estimates from GAB officials.